Buy through MusicWeb £12.49 postage paid World-wide. Recently I stood under the tower in the huge parish church of St. Botolph in Boston [details]. I had beside me the grave slab to ‘John Taverner – Musician, died 1545’. Plugged in to my portable, if somewhat outmoded, CD player, I listened to the Gloria from this mass, I felt about as close to the composer as it’s possible to be. This indeed was the church in which he had spent a great deal of his life in the town which he knew. However we do not know when he was born or where but it’s most probable that he was a Lincolnshire man as he had served an apprenticeship in the parish of Tattershall. Lord Cromwell’s castle next to the large collegiate church, which also had a fine choir, is not that far from Boston. Incidentally Tattersall Church often plays Taverner’s music as you walk around. As the sun glittered through the clerestory windows of St.Botolph’s, windows inserted in Taverner’s lifetime, the clarity of his lines and the magnificent brightness of the late medieval church came together. The late Colin Hand’s book on the composer (Eulenberg; London 1978) is worth finding for the sharpness of its analysis of all eight masses. Of this one he comments, in comparing it to the vast ‘Missa Corona Spinea’ (p. 46), that "it reveals even greater mastery of construction and balance and may justifiably be regarded as Taverner’s finest work". To create this balance Taverner is always varying textures with long sometimes quite melismatic sections for two or three solo voices contrasted with full choir, then lower voices only, then higher ones. In addition the complex ‘In Nomine’ section of the Benedictus was long admired by Elizabethan and later composers as an example of ideal counterpoint over the plainsong tenor. It was used for didactic purposes no doubt and also as a basis of many other ‘In Nomines’ including those by Purcell and more recent composers; indeed I have used it myself. Also, each movement begins in more or less the same way using a technique called a ‘head-motif’. For me, this is, in fact the third recording I possess of this mass. They are all quite different. The Taverner Choir under Andrew Parrot put the mass into its liturgical context as was common practice in the late 1980s with therefore, yards and yards of plainsong (on EMI nla). Then I have a wonderful recording on Glossa (GCD 921401) called ‘The Marriage of England and Spain’ which puts the mass into a supposed context of the royal marriage surrounded by motets and instrumental pieces by other English and Spanish composers (The Orchestra of the Renaissance under Richard Cheetham). Cheetham gets through the music quite a bit faster than Darlington as the instruments seem to want to move the polyphony forward. I also own a recording by The Sixteen on Hyperion, a version which has been called ‘intimate’ and which was recorded in 1984 (CDA55052). There is also a version by The Tallis Scholars, which I don’t know, but both of those groups use women on the soprano lines and quite often in the alto lines too. So why should I keep this new version? Stephen Darlington writes in the booklet ‘The Choir of Christ Church Cathedral’s recording is the first to use the original forces of men and boys as envisaged by the composer’. That is why this recording is precious. The choir, or more especially Stephen Darlington, is not new when it comes to Taverner. In 1990 Darlington recorded the rather simpler ‘Missa Mater Christi’ for Nimbus (NI 5216) in its liturgical context. In 1993 he recorded a series of motets, including the ‘Dum transisset sabbatum’, recorded also on Nimbus (NI 5360) on a disc called ‘Ave Dei Patris Filia’. Darlington therefore knows the difficulties that can occur when boys tackle this repertoire. It has not been common to hear boys in early Tudor church music and there are only a few examples. The reasons are various. The tessitura is mostly much higher than the norm nowadays, putting considerable strain on the voices as passages are rehearsed and re-recorded so that a huge mass must be ‘canned’ over several sessions. Secondly the music is difficult, rhythmically so, and it takes boys with ‘nouce’ to pick it up quickly. By the time a boy has the musical intelligence and experience to tackle the music, especially if you are using him in the soloistic sections (often the most complex) his voice is on the verge of breaking. Even so, there are times when that typically pushed and slightly distorted vowel sound is heard in a painfully long phrase and when intonation is a little suspect, Darlington also encourages a kind of continental vibrato which may not always appeal, but on the whole this is as good a recording of a male voice choir singing polyphony as you ever encounter. So, an especial thank-you is required to all concerned not least the recording engineers to allow us a chance to listen to this music, though without much plainchant, as Taverner probably heard it. The supporting motets which Darlington has recorded before, including a more interesting and faster performance of the ‘Mater Christi’ motet than in 1990, and plainchants are equally beautifully performed and recorded. The whole enterprise is nicely presented, very similar in look to the Nimbus presentation of the earlier Taverner discs mentioned above. Full texts are offered along with an excellent essay by Andrew Carwood and photographs of the choir. 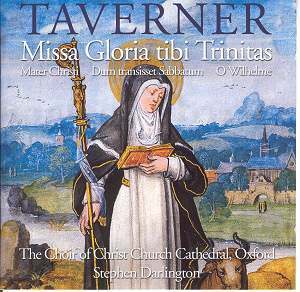 If you love this music then you should not hesitate to get this disc and if Taverner is new to you, then this great masterwork of the early 16th Century is as good a place to start as any. This recording gives the music every chance to be at its best.